For your viewing pleasure, I have listed all of my articles that have been archived on wheatonrecord.com for The Wheaton Record, my college newspaper. The majority of them were written for my column, named “Closer Look into World News,” so I listed those first as they reflect my approach and voice in news writing. In “Closer Look,” I examine headlining world issues (or lesser-known ones) and connect them to the Wheaton campus. The last three articles are from my general assignment news articles, which cover various, equally intriguing topics. To clarify, these stories are only ones that were put online. The many others I’ve published are in only print. Let me know what you think! Proxi Competes in Elevate Competition — Funny story about this one — I wasn’t actually in the newsroom to add the headline because I was shadowing at the Tribune (read here), so someone made it “An Elevated Calling” (har har). I’m not particularly opposed to it, but I like to think I would have made it something more special. I got the opportunity to interview each and every team involved in Elevate because I’m the design chair of GLOBUS, our school business society. As each team nervously waited to present, Shark Tank-style, I gave them a little practice by interviewing them for the paper. Win-win! 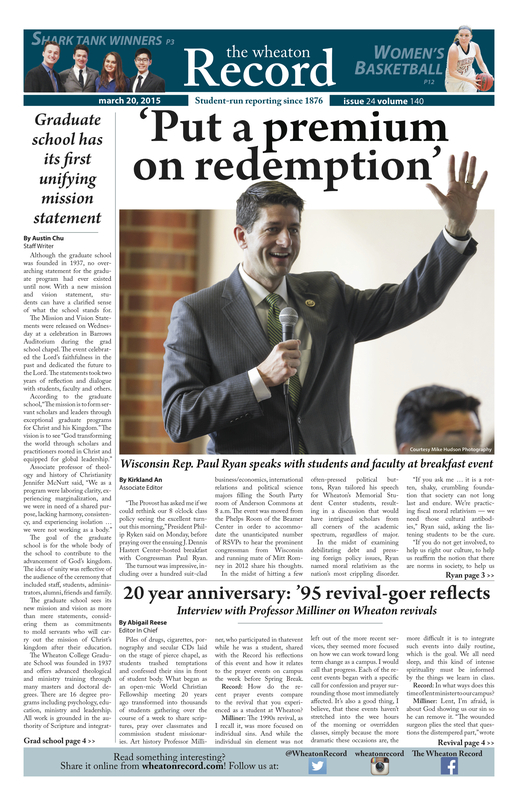 Congressman Paul Ryan Speaks at Wheaton College Breakfast Event — NOT a headline of my own making! It ran as “Put a premium on redemption,” (see here) which was the main point of Ryan’s presentation at the breakfast event, surprisingly enough. With this article, since I had a whole speech at my disposal, I tried to rely more on my own analysis and words rather than direct quotes, which would have been super easy. Wheaton professors on Copenhagen, extremist terrorism — We’re so lucky to have such a stellar philosophy department at Wheaton College. I interviewed Dr. Wood to get a different angle on extremist terrorism and was not disappointed by his comments. Read more about the making of that article here. King Abdullah II’s approval high in Jordan, students say — Writing this article made me more aware of the devotion of Wheaton students to learning in the face of danger, but also how the Wheaton community can help the Jordanians in their most recent crisis. Read about how I wrote it here.